Outdoor group portrait of five young people at Lasley's Point near Lake Winneconne. 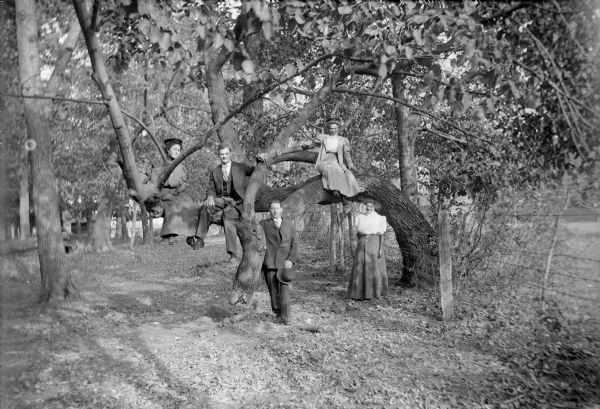 Two woman and one man sit in the branches of a tree, and a man and woman stand on the ground. They are, left to right: an unidentified woman, an unidentified man, George Miller, Mary Ansorge (in tree), and Edna Hudson. The trunk of the tree is arching over a wire fence on the right, and in the far background is a building. Fallen leaves cover the ground.